There are many different ways to leverage whiteboard surfaces to support active learning and student engagement. Today, we will focus on using portable white boards for an ice breaker activity. Whiteboard surfaces give students an easy platform to write, draw, and share ideas with peers and instructors. However, not all classrooms have whiteboards, or enough of them, for student activities. Bringing portable white boards into the classroom is one way that instructors can give students the tools they need to engage in a variety of active learning activities. 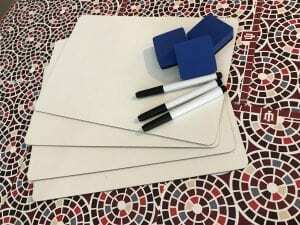 Portable whiteboards are inexpensive and can be purchased with erasers and markers to go with them and are a great way to make any classroom and active learning space. 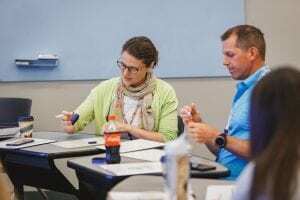 An ice breaker activity is a simple yet effective way of illustrating the power of white boards to create community within a class and to reveal what students know, hope to know, or are initially thinking about a course. I’ll share an example of one such activity we utilized in a recent Mosaic Institute. What do you hope to get out of the Mosaic Fellows Program? Draw it. We give the new Fellows a few minutes to draw their ideas. Usually there is a bit of laughing at stick figures, some pauses of uncertainty about how to represent an idea in picture form, and plenty of writing and erasing. Using the small portable whiteboards allows them to express themselves quickly and creatively. Next, we ask them to share their ideas with one another. By asking Fellows to reflect on what they hope to achieve from the program, the utility of the whiteboards is clearly illustrated: as instructors, we receive immediate feedback while at the same time the Fellows learn about each other. Because it was a small group, each person could share their ideas with everyone. Arranging the Fellows in a circle also helped facilitate a sense of community by allowing everyone to face each other, share their ideas and provide feedback. As session leaders, we were present and listening to the Fellows conversations, allowing us to gain valuable insights into both their initial thoughts and what they hope to achieve during their tenure. However, we did not sit with the Fellows as to allow them to look at, and converse with, each other instead of directing their comments to us. Kelly Scholl (in orange) was a session leader and intentionally not sitting as a part of the circle. Small portable white boards are a great way to encourage your own students to reflect, share, and engage with one another on the first day of class and beyond. What do they hope to get out of a particular course? What aspect of this course are they most excited about? What aspect they are most concerned about as they begin the course? What do they know about a key course concept? How are you using portable whiteboards in your classes? Share your ideas in the comments below, or contact us to write a blog.